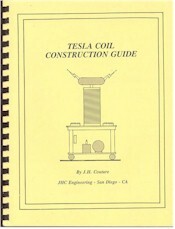 A complete revision of the author's 1988 Tesla Handbook, this book contains plans for building five different oscillators capable of producing spark lengths ranging from one inch to 8 feet. All of the plans have been created using the latest knowledge in Tesla coil engineering and are backed up with actual models built and tested by the author and others. A unique step by step design procedure accompanied by graphs and illustrations will guide the builder through the layout and assembly procedures using manual calculations. The Guide contains 19 sections and 37 illustrations.